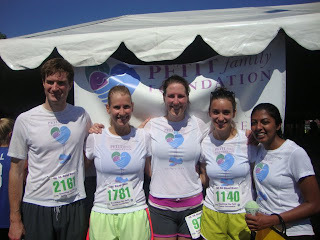 Team Petit Family Foundation Running Team: 3:20:45, dropping 16 minutes from last year's finish! 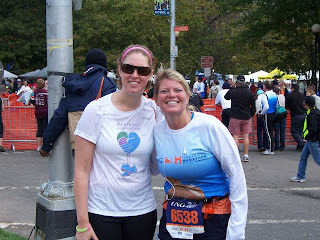 Here is Caroline bringing it home and Meg showing her support for Hayley. 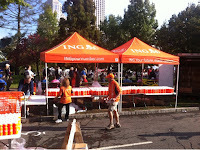 Tara ran the 5k in 28:40 - nice work! Sara ran the 5K and her cousin, Flo ran the 1/2 marathon and both did very well! More photos to come later. 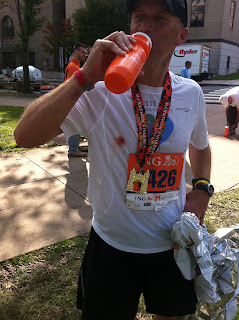 Thanks to all that ran and all of those who sent their love and support. It was a great day! Good luck to the Miss Porter's crew that is running in Newport tomorrow - be the change! Our trusty 4 and anchor legs, Tim and Caroline! In honor of Hayley Petit, who would be celebrating her birthday today. We are all here and most are off and running! 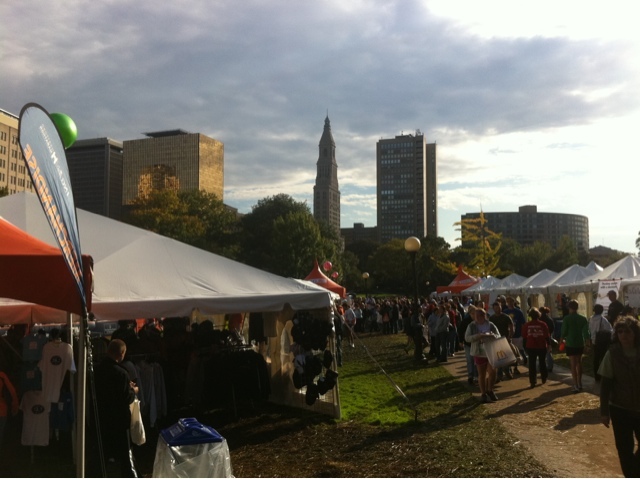 I toed the line with Mike before he shot out of a cannon, definitely after a fast marathon time. I just handed off to Meg, who will. Then pass off to Dave, who passes to Tim, who hands off the anchor stick to his daughter and speedster, Caroline. Should be great!!! Harry has always been a motivated man, but he has taken his own ambitions to a whole different level - and brought a lot of folks with him. Harry spent most of his life in Holyoke, MA, and knows how rough life can be in the city. Role models are hard to come by, and watching the local news can get even the most optimistic folks down. But, Harry is a different human being altogether, as in the ones that don't seem to come from planet earth. Harry is one of those people that will take any piece of positivity and own it, polish it, and share it with the world. It's been an honor to watch this young man grow into the man he is now. 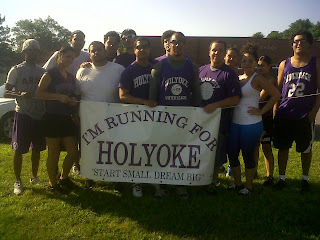 And it's no surprise he wants to put Holyoke on his back and show his hometown that you can, "Start small, dream big." 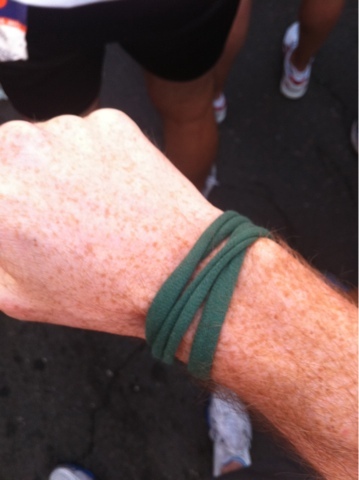 A few months back, Harry started a running group of his own. 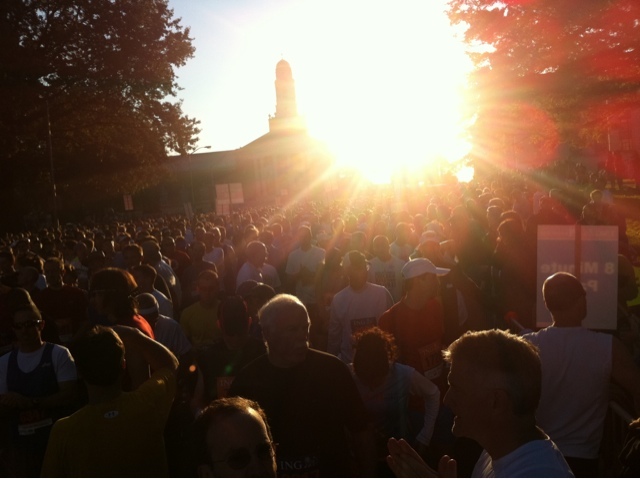 He wanted to inspire his fellow residents to get up and show Holyoke how get inspired, to make a difference. So, he reached out to a few friends and started running. Just like the saying, they started small with an eye on bigger goals. 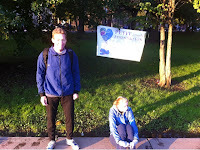 Harry made sure the running routes were marked, driving from street to street to put up directional signs. Slowly but surely the group got bigger and runs got longer, with Harry always leading the way but heading back to check on the entire group. Fast forward to today, and the group is not only running, but thriving. The runs have gone from one day a week to two, with more and more people showing up as the weeks go by. Harry, always a competitor, makes sure to keep the juices flowing by encouraging team members to join local races to see what they are made of. This weekend, the group is going a bit further and running a 3.5 mile race around the Holyoke Reservoir. If I know Harry, he will get out quick to push himself, but always make sure he loops back around to get the whole crew through the course. With a handful of local business signing on to help the group out with signs and shirts, I see Harry and the Holyoke crew inspiring their fellow citizens for years to come. 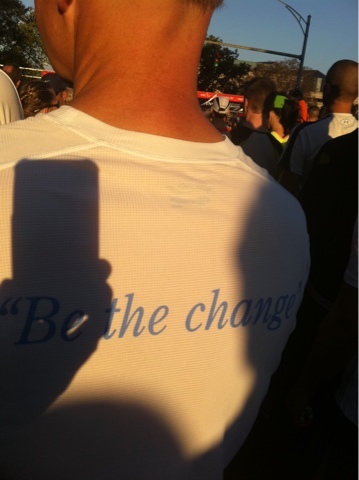 I can't be more proud of Harry and all that he has done - he certainly embodies the PFF motto, "Be the change." In total, 17 team members of all ages will be on the line representing the PFFRT. It's an amazing to think about how far this small team has come. 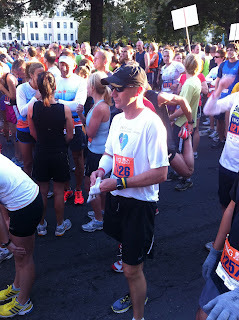 We even have a team member coming all the way from Texas to run. Way to go the extra distance, Bill! Stay tuned for updates, results and pictures - it should be a great time! 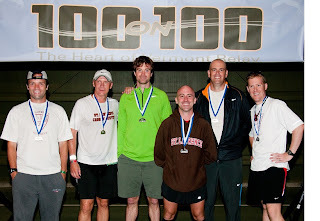 PFFRT members run the Vermont 100 on 100...and win! A few members of the Petit Family Foundation Running Team joined forces with a handful of other runners to take on the tough Vermont 100 on 100 race in August. The race, a 100 mile relay race on Route 100 in Vermont, is well known by distance runners as being a test of resolve and ones quadriceps. Mike and Brian decided to give it a go with fellow St. Lawrence University alumni to see what they were made of...and ended up winning the masters division! The course is a brutal one, starting at the Trapp Family lodge in Stowe, winding up and over the Green Mountains, and finishes at the top of Mt. Killington. It is gorgeous, as well, with many stops along the White River to rest your sore legs. 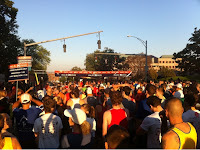 Each of us ran a 3 separate legs, usually around 2 hours apart, with a total average of 15 miles a piece. Mike and Brian's team finished 7th overall out of 107 teams with a time of 11 hours, 22 minutes and 55 seconds; that's 6:59 pace for 100 miles! It was an amazing time, and a timely one at that as much of Route 100 was impacted by Hurricane Irene a few weeks later. It is tough to look at the images of so much damage to a beautiful landscape we were just running through. Our thoughts are with all of those still affected by the storm. 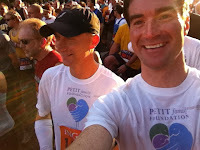 Great day, great race, great to be part of the PFFRT! 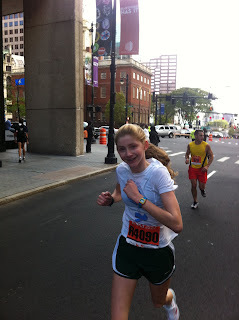 PFFRT member Caroline may be new to high school cross country, but she hasn't let that intimidate her. You see, Caroline is already a seasoned veteran, used to running in front of big crowds. How, you ask? 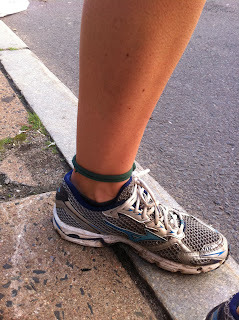 Simple - she has been the trusty anchor leg for the Petit Family Foundation Hartford marathon relay team anchor for the last two years. Caroline took on the pressure of finishing strong and has done so with speed and maturity beyond her years. She has signed up to take on the honors of the anchor for a third straight year and we can't wait to see what she is going to do. Caroline hasn't shied away from older runners so far, as she has been right up in the front of the pack from the first race of the season. A consistent #1 for her team, Caroline can be found crossing the finish line in the top three in almost every race. I know, that's a pretty aggressive statement. However, Mike is literally a Saint, or at least a coach of a few lady Saints. Coach Mike has his lady Saints cross country team running impressive times early in the season and looking to make a statement at the upcoming NCAA pre-regional meet. The St. Lawrence University XC women's team is familiar with the spotlight, as they climbed as high as #2 in the national in last year's polls. They roll into this year after winning the last TWO individual titles at the national meet. Good luck in the rest of the season, Mike! A former stand-out runner himself for SLU, Mike will be making his marathon debut in a few weeks in Hartford. While Mike thinks he is an old timer, we just think he's really fast. Good luck, Mikey! PFF takes the title in....India? Team member Katie is currently in India and decided at the last minute to run the Shimla half marathon. In fact, she only found out about the race during a train ride from Delhi to Shimla on a Friday and registered the next morning. 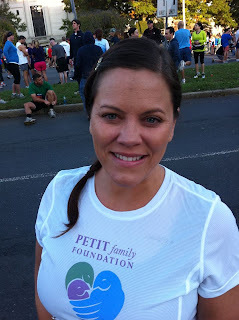 She laced up the sneaks, roudly donned the Petit Family Foundation Running Team shirt, and took off at the gun. Yep, that's right. Katie covered the brutal, hilly course in just under two hours, even though it was at an average altitude of 2,200 feet. For her efforts, she took first place in the women's division. I am sure she doesn't want to be recognized publicly, but we have to point out the awesomeness that is Jacqueline. While she will not be running races with us in the near future, she will be in Amman, Jordan as part of the Fulbright grant she was awarded. How awesome is THAT? Way to go, Jacqueline, we are proud of you! We have been quiet for a while, but it's because we have been quite busy. Many of our team members have been hitting the road, running races, and really just doing a lot of pretty awesome stuff. RECORD turnout overall - 7000+!!!!!!!!!!!!!!!!!!!!!!! That is pretty spectacular. Having run tons of 5ks, I can say with absolute certainty that I have never been to a 5k with those kinds of numbers. 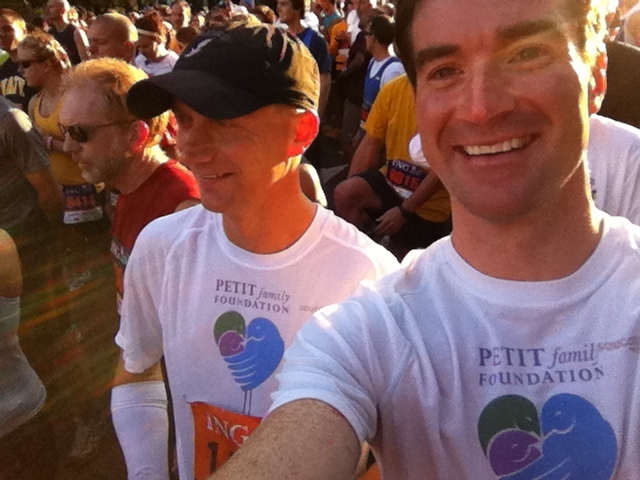 The Petit Family Foundation has really got something going and it's incredible to be a part of and watch it happen.